Used For: The herb is applied to stimulate the system, boost metabolic rates, induce urination, promote perspiration, and kill helminthes. 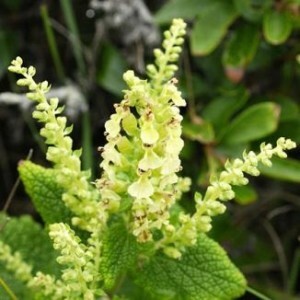 Wood Sage is applied for loss of appetite. It can be applied topically as an effective remedy for boils, swellings, indolent ulcers, and old sores, especially when mixed with chickweed. If applied as a poultice in conjunction with ragwort and comfrey the plant is conventionally employed for tumors and cancer. Moreover, in folk medicine the herb is used for bladder and kidney conditions, fevers, colds, sore throat, quinsy, and palsy. It can also be used to induce menstruation and urination. Preparation and Intake: The daily dose is half to a teaspoon of herb extract. Safety: There is no data concerning the herb’s safety level. It is possible that the plant interacts with the medicine you use. Speak to your health-care practitioner prior to using the herb.